The only effective treatment for all of my kidney infections I have endured is unfortunately IV antibiotic treatment while being hospitalized. I have suffered from five kidney infection throughout my life, and home antibiotics simply do not work for me and I continue to worsen. So the best treatment for mine have been IV antibiotics. The last time they had me on three different antibiotics at one time, as well as IV pain medication and IV fluids. The kidney infection started one morning with pain in my right flank. It was a sore-ish feeling that became worse with walking and bending forward. It wasn't too bad so I didn't think about it much and went on with my day. I went to the gym, and after running about a mile I started feeling a flu-like sickness throughout my whole body. It went away after a couple hours of rest. I had to babysit overnight that evening. After putting the kids to bed, I made myself something to eat but then started feeling very nauseous and opted for a ginger-ale instead. I laid down and hoped it would pass, but it got worse throughout the night. The flu-like feeling came back, I had chills, and could not sleep. I felt the most fatigued and weak I had ever been in my entire life. I had to get the kids ready for school in the morning, and I honestly have no idea how I was able to get through it. I had to sit down many times between getting them dressed and making their breakfast. When their dad came home, he offered me Tylenol so that I would be able to drive myself home. I waited about an hour and felt a little better and drove myself home. I immediately took a nap, which lasted about 2 hours. I woke up feeling a little better. I had planned on going to the beach with my boyfriend and I was lucky my boyfriend's mom was there. Right before we were about to leave, she noticed how pale I looked and how I was not acting like my normal self. She insisted that I stay, and I didn't have the energy to refuse. About 30 minutes after deciding to lay down again, the pain got much, much worse. The flank pain was unbearable, and the body sickness was so bad that I was crying in pain. They took me to the emergency room (ER). The pain just kept getting worse throughout the wait. I was in the worst pain of my life. I felt like I was going to die. Finally, after being called in, I was put on IV and given pain medications. I had a fever of 103. I got a CT scan and x-ray. I was told I had a very high white blood cell count, and I was extremely dehydrated. Apparently my appendix was slightly enlarged, so they thought I had appendicitis. The surgery was scheduled. Luckily another doctor had a second opinion, and it was concluded that I had a kidney infection. Still, they wanted me to stay overnight to monitor me. During the night, my fever went up to 105, which caused alarm, but I don't have a lot of memory of that night. In the morning I was told that they wanted me to stay for at least 3 more days. I told them I could not stay that long because I had school and work. So they sent me home with pain medications and antibiotics. That night was horrible. I was in extreme pain again, went back to the ER, put on stronger pain medications, and then sent home again, only to be in severe pain again. I just waited it out. After about a day I finally started to feel better. After 3 more days I was able to go to school again. Very scary and painful experience. I started with a stomach ache, nausea and vomiting; then the next day felt fine. The third day vomiting again. On the fourth day I went to the doctor who said I have an elevated white count possibly a kidney infection or stone. They sent me home with Cipro after a shot of Rocephin. I went back yesterday, I still have an elevated white count. They gave me Flagyl, and also pain medications and nausea medications. The last 3 days I have flank pain, initially the pain was in the top of my belly now it is in lower abdomen and the left flank. I have had urinary tract infections (UTIs) for as long as I can remember but this kidney thing is awful. I found out that taking baths is a very easy way to get this. If I do not disinfect our bath tub every time immediately before taking a bath, even if the tub has already been cleaned and I have taken a shower first. I am likely to get a UTI. Another way is douching too often; it tends to kill the good bacteria, which I also do sometimes. For me Cipero works well without the problem of the yeast infection that usually goes along with being on a strong antibiotic. Remember, Disinfect your tub first before you take that long relaxing bath or you will wish you had. Hope this helps. There are several cause of kidney pain in the morning including kidney stones, kidney infection, urinary tract infection, and kidney cancer. The best treatment for kidney pain is to have lots of water, whole wheat bread, kidney beans and lemon juice. I had been training for a marathon the last few weeks, and the day after my schedules "hard" work out, I woke up with major back pain: couldn't rotate my hips forward, sideways, backwards... Then that following Friday night my back pain eased but moved to my right side. It felt almost as if I had pulled a muscle that night without knowing it. So I went to bed, and woke up at 4 a.m. in sheer anguish. My right abdomen ached, my entire back was hurting again, and I felt like something was ripping on my inner right side. Went to the ER two hours later and was quickly diagnosed with a kidney infection, caused by a UTI that I never knew I had! They prescribed me ciprofloxacin, ondansetron, oxycodone, and then directed me to take an inserted antibiotic 2 days later. The only reactions I've had since the ER visit is an all-over body itch due to the oxy, and a yeast infection from the inserted antibiotic. I had a UTI/kidney infection last December. I didn't really have any symptoms the day before. But, I woke up at 7am and had UNBELIEVABLE stomach pain that went all the way around to my lower back. My Cousin was sick with the flu at the time, so my aunt and uncle thought it was just the flu. But, no way, I know what the flu feels like, it wasn't that. Then, I started throwing up. I couldn't keep anything down, not even water. I knew I had to go to the hospital, so I called 911. I had severe dehydration and my blood pressure was pretty low. So, I had a pretty serious infection, even after not having symptoms. Man, I do not ever want another kidney infection! I had a urinary tract infection that turned into infected kidney stones and then the infection went to my blood stream. I had to go to the ER at the hospital and had emergency surgery to put a stent in and then 5 days later I had my kidney stones taken out because they were so infected and when I got home from the hospital they said I had bacterial infection in my blood stream. If I would have waited an hour to go to the ER I would have been dead. I was lucky. Then I got my stent out a week later after the kidney stones were out. I had a cold but after the cold symptoms went away I still had a fever of 100-103 for 10 days. I thought it was the flu so I avoided the doctor. I got worse and I had shivering chills and pain all over. Went to urgent care and sure enough, kidney infection. I've had them before but I knew it because my back and hip hurt so bad I could barely walk. Got Cipro and fever was gone by next day. Go to the doctor if you think you might have a kidney infections! They never go away on their own. Eventually the doctors got it right and prescribed cefalexin but only after being in agony for 2 weeks. Was prescribed other antibiotics but there was no follow up and were not working properly. All my life I have suffered from UTIs, in the last 4 years I've had two kidney infections, but now I have been having left flank pain off and on since. I had back pain about 3 years ago. I went to the ER with back pain. After much testing the doctor tells me I have pre renal failure. I was told to take a heavy dose of prednisone 40mgs daily. It eventually cleared up after a visit to a Nephrologist. Prednisone really messed up my female cycle. Now for about two weeks I have been having a dull ache in the left of my back into my groin and down my leg in the thigh. Starting today it is sharp constant pain. Like I have been punched in my kidney. It still continues to my groin into my thigh. I'm worried but I have no insurance because I was laid off from my job collecting a small amount of unemployment and can't afford much. I want to be taken seriously if I go but it's a toss-up as to the care I receive because of that. I urinate 4 or 5 times every night, I am seeing a urologist and I am taking Flomax and Sanctura, but I still have the problem. I have no leakeage or back pain. The doctor did a stenoscopy with a camera and I saw it, he said my prostate looks good and my bladder looks good, but I don't know why I continue to go urinate 4 or 5 times every night. 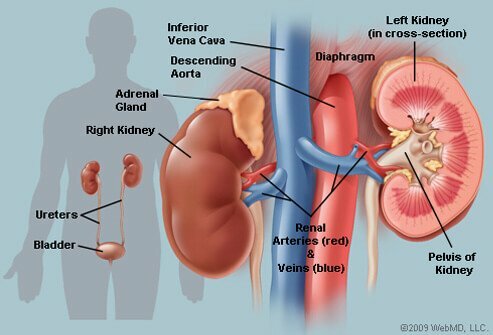 An MRI revealed that there is a cyst on one of my kidneys, but the urologist says not to worry. Sunday night I woke up with lower back pain. So I assumed I just slept wrong. So I went to work for three more days same thing lower back pain so I assumed I had the UTI that I get yearly. This time I noticed it didn't burn when I would pee and it was strange as I drink entirely too much water and my pee was not clear it had a yellowish tint. So I finally went to the doctor and came up with a kidney infection. Well I am on two types of meds for now three days but my entire lower half is swollen I look huge. I just pray this medicine works as again I have had UTI's before but not this type of feeling. My lower back feels strange and I can feel the kidneys flicker if that makes any sense? Well hope the meds work.